Some house guests came to stay with us today. 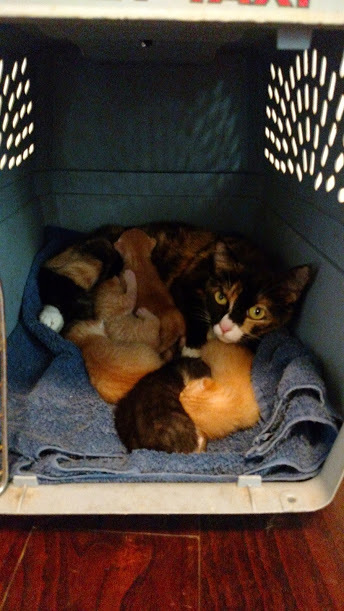 We weren’t actually expecting them until next weekend (and it was only this morning that we decided we were okay with taking them in in the first place), but circumstances changed, and suddenly now we’ve got visitors – a very nervous young lady and her six infant children. They say house guests and fish start to stink after 3 days. However, this little family will be staying with us for a couple months. Normally I might be really anxious about opening up my home to visitors, especially such a large number all at once. But, well, I think you might be able to tell why we’re both really excited to be providing a temporary home for these seven homeless souls. Without further ado, let me introduce our temporary houseguests. Meet the Supernatural Kittens. Mom’s age is uncertain (although she seems pretty young and she’s quite small), while the babies were born somewhere around last weekend. As usual, click the pictures to embiggen. Mom, Ruby, is extremely nervous. She’s not feral, but it’s clear she’s fearful and uncertain about humans. We can reach in and pet her, and she’ll purr and knead on her blanket, but that’s about as much as she’s willing to tolerate right now. We’re pretty sure, though, that it won’t be long before she relaxes and figures out that humans can be pretty awesome. As for the babies, here’s a better shot. As far as we’re able to tell right now, they’re all boys. You might notice that the five orange ones all look exactly alike. I’m hoping as they get a bit older they might develop some distinguishing characteristics; otherwise we’re going to have to dab some food coloring on their tummies to tell them apart until they’re old enough for collars. 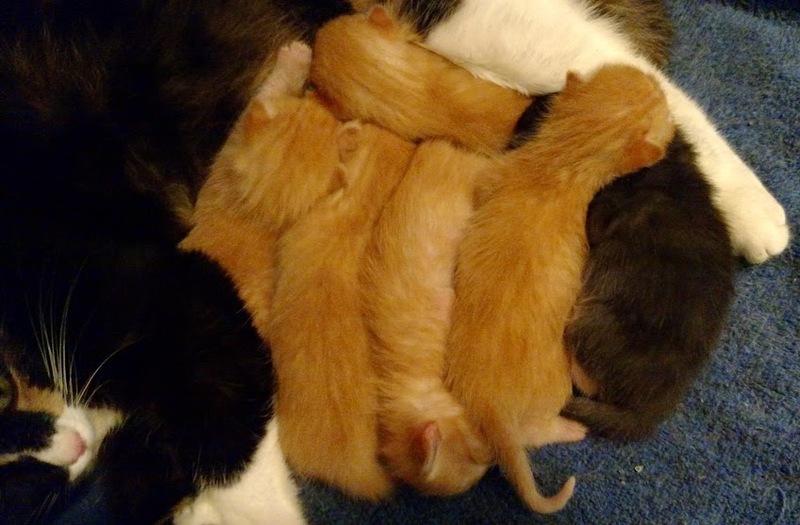 The orange ones are, in no particular order, Sam,Dean, Rufus, Bobby, and Castial. The little black lump to the right of the pile of orange fuzz is actually a tiny little tuxedo, who has been dubbed Crowley. I have to tell you, this is going to be a really hard couple of months. 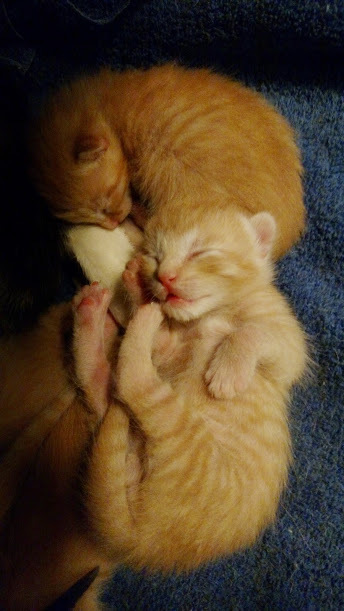 Having to socialize half a dozen itty bitty teeny weeny kittens. I mean, look at this. Who’d ever want to spend time with this? Yeah. Hosting these house guests is going to be rough. The letter R is brought to you by the Blogging from A to Z Challenge. Mom and babies are gorgeous! I was always stupid enough to bottle feed orphans, which means getting up in the middle of the night multiple times until they’re eating solid food. You chose a much better option.